A great story has visual clues. I'm the geriatricstarlet and I dug up this jewel with my red-handled shovel, but what could it be? This is somewhat like a Pyramid shape with pearls denoting its origin in the sea. Which sea? The sea of Cortez, the Mariana Trench or the Gulf of Carpentaria? I hear there are pyramids under water everywhere! What a mystery! What a puzzle! 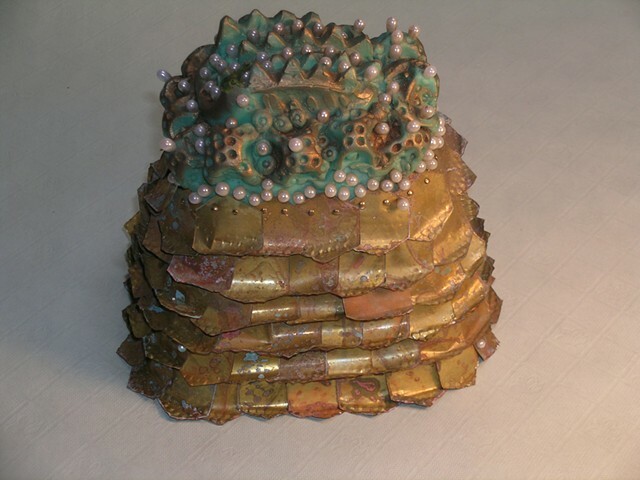 This object has the same bio-sponge-looking stuff as another treasure with one striking difference - in the middle here and at the top there seem to be cogs for some ancient gear mechanism. What kind of a machine could the Ancients have had? Maybe the Mermaids used it to grind mother-of pearl for water-proof eye makeup. Or … maybe it was a Sea Cucumber grinder, that reeled them right into the cogs and sliced and diced them for asian gourmet markets. OR... maybe the Phoenicians made Pasta with interesting shapes using this device.